At least 27 people have been injured after four explosions have rocked the city of Dnipropetrovsk in eastern Ukraine. The first two blasts happened at a busy central tram stop and near a local cinema, according to officials. All the devices were apparently planted in rubbish bins. 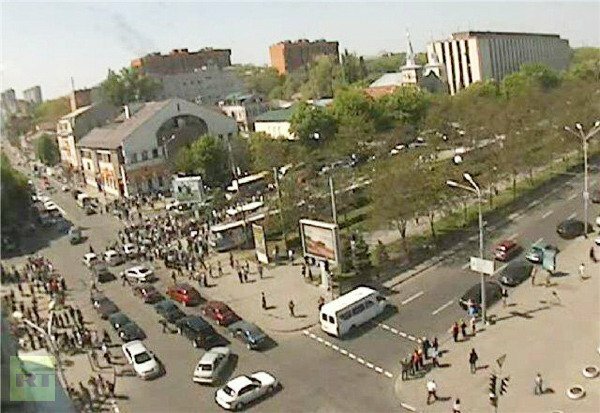 No suspects have been identified yet and such an attack is unusual for Dnipropetrovsk. The industrial city is the birthplace of jailed opposition leader Yulia Tymoshenko. “This is yet another challenge for us, for the entire nation,” President Viktor Yanukovych said. The first explosion injured five and the next, 30 minutes later, injured seven. Tensions are running high over the alleged mistreatment of Yulia Tymoshenko. She was a leader of the pro-Western Orange Revolution in 2004 but her chief rival, Viktor Yanukovych, won an election in 2010 and forged closer ties with Russia. Ukraine is also preparing to co-host the Euro 2012 football tournament this summer.